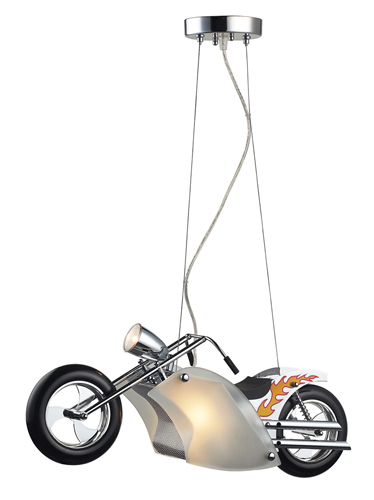 Motorcycle Pendant Light in Satin Nickel - Cruise proud with this chopper style motorcycle light. Chrome accents, flames, and an actual working headlight highlight this wild ride. The motorcycle ceiling light pendant is the perfect finishing touch for a little boy's bedroom or playroom. Motorcycle pendant ceiling light takes two 60-watt candelabra bulbs and one 20-watt MR16. Satin nickel and chrome finish.